Haven't we all made some bad decisions in life? But for Abraham, his mistakes are being studied 4,000 years later! One would think that God would not be so hard on Abraham for his bad decisions. God recorded Abraham's mistakes right beside the great promises the LORD gave to him. We feel awkward even reading the account. Disobedience always costs. God does not count how long you have been a Christian or what you have done for His kingdom. If anything, we find that those who get closer to God are held up to a more scrutinizing standard than others.  1.) Understand more of Abraham's weaknesses so that we can better learn from his life.  2.) Show how insecurities develop and avoid such paths.  3.) Be aware of relativism and instead pledge to live by God's Word no matter what it costs.  4.) Reject making life decisions by our senses and prioritize faith. 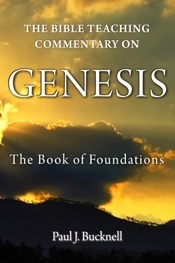 Get the 300+ page book on Genesis! See details. We have a difficult time understanding the consequences God brought to Abraham's life if we do not rightly understand God and His ways. God treats holy those who are close to Him. We see this illustrated by the fire that came from Yahweh's presence to consume Aaron's sons, Nadab and Abihu. Moses tried to calm Aaron down by explaining God's strong action in Leviticus 10:3. And before all the people I will be honored. It was only after this that Aaron was willing to quiet down. We find this same demand for holiness to be among Abraham. We find it with all of God's people. Disobedience reveals an arrogance that we have about God. We find our opinions or judgments to be more worthy than what God has said. With this theme in mind, we can learn from the mistakes of Abraham. We can learn from the study of history but in the end, history is the study of the decisions and consequences of decisions that certain individual have made. We here will here explore three detours that Abram took which got him off God's path. What is a detour? A detour is a long way around. A detour takes you off the best path but later after much inconvenience brings you back on the main road. We should always have faith that if we humble ourselves, that God in His great grace will again bring us back to that main road again. Let's take a good look at them. The reason that they were recorded were to keep us from making the same mistakes in our spiritual journey. Went where he wasn't suppose to. Relativism is a popular cult among God's people but its history goes way back. Whenever people adjust God's commands or directions according to their own preferences and tastes, we see evidence for this relativistic mindset. How serious do you take this warning or relativity?